Branson Tractors, LLC was established in 2003 in Lafayette, Georgia, USA, from the original Branson Tractor Company that was set up in 1988 to import tractors from Kukje. It was originally set up as the Dragon Tractor Corp in Placerville, California, USA in 1987 to import tractors from China under the Dragon brand, but was moved to Lafayette, Georgia shortly thereafter. In 2003, Kukje established Branson Tractor, LLC in the USA to distribute tractors under the Branson brand name. They also manufactured tractors sold under the Century brand in the USA. In 2009, Kukje signed a letter of intent to merge its Branson Tractor company with USA-based Montana Tractors. Kukje Machinery is a South Korean company which manufactures tractors, combine harvesters and other equipment under the Kukje brand. It is a subsidiary of Dongkuk Steel, a large conglomerate. Kukje was founded in 1968 as Korea Agricultural Machinery Co., and changed its name in 1978 to name to Kukje Machinery Co.. In 1980, Kukje signed a technological agreement with Yanmar of Japan. In addition, Kukje has manufactured/distributed some John Deere tractors since 1987. In 1995, Kukje established its diesel engine manufacturing plant, and in 2002 established an agreement with Cummins to build and supply engines for them. We are now supplier of National Trust approved bird food. 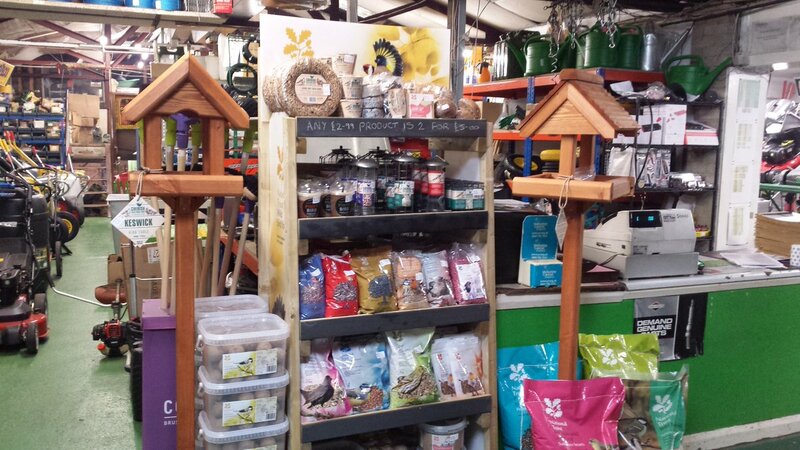 We stock a large selection ranging from your standard Wild Bird Seed Mix to Suet Cupcakes. A contribution is made to the National Trust with every purchase. To put the record straight, a cultivator, a rotovator and a tiller are all the same thing, an earth turning machine of varying size that is equipped with rotating metal tines that are normally powered by a petrol engine. They are designed to save hours of backbreaking work with spade in hand and can produce a variety of different end results depending on the cultivator or tiller that you choose. It is possible to break into virgin ground with a heavy-duty cultivator, transforming otherwise neglected or unused terrain into a vegetable garden or fine lawn. With a mini tiller it is possible to prepare small areas of vegetable garden for seeding or, if applicable, use it to remove weeds from between rows of existing crops without resorting to the use of a hoe. When buying one of the larger rear tine tillers it is worth considering whether it is adaptable to other accessories such as mowing decks or snow blowers, increasing its range of applications significantly. There really is a cultivator, a rotovator or a tiller for every gardening application you can think of with multiple accessories and attachments available to help you get best value from your initial purchase. High quality garden tools are hard to find these days with the vast majority of products available of inferior construction and not always up to the task they are intended to fulfil. Whether it is a set of hedge shears, tree loppers or secateurs that you require, you need to know that they will perform properly, not simply for your own benefit but also for the health of your plants with clean cutting tools reducing the risk of infection and disease. Browse through our ever-increasing range of hand-held garden tools from select manufacturers to ensure that whatever product you choose, it will be of the highest quality and provide many years of trouble free use in your garden. Petrol powered generators are invaluable sources of power for numerous different applications across the globe. They can be essential in areas where electricity supplies are unreliable or completely lost after disaster and no construction site would be complete without several dozen generators buzzing away in the background. Petrol generators are also essential to the leisure industry with campers and caravan owners relying heavily on them when on long tours or holidays. There are many different models on the market to suit the countless applications they can be used for with the lightest weight versions suitable for camping and expeditions whilst the heavier, more powerful units best suited to construction sites and industrial locations. An increasingly popular piece of garden machinery over recent seasons, chiefly because of the rise in popularity of wood burners and peoples’ preferences to prepare their own firewood, the log splitter provides a safer and less tiring way to split wood than with the traditional axe or maul. The quantity and type of wood that you intend to split will determine the size and style of log splitter that you purchase. For normal sized logs that are soft wood or unseasoned hardwood, a standard electric log splitter with 5 tons of splitting pressure will suffice. If you have a large quantity of wood to split, it is preferable to use a more powerful log splitter with an upright stance; these machines are capable of accommodating large logs and normally operate with 6 to 8 tons of splitting force. Petrol log splitters are also an option, capable of delivering splitting forces between 8 to 10 tons, more than enough to split seasoned hard wood and ideal if no electrical power supply is available. There is a tool for just about every job in the garden nowadays, some having infinitely more use than others. The drawback of having this vast array of equipment at your disposal is the amount of space needed to store so many different gadgets. Garden equipment manufacturers were quick to see an opportunity here and promptly began to design power units that came with a series on interchangeable attachments that took the place of existing stand-alone devices. The all-conquering multi-tool was born. The range of accessories available to begin with was modest, only basic attachments such as hedge trimmers and brush cutters being available. However, over the years more and more new designs have been introduced until a now almost endless selection of accessories and attachments are available. It is possible to choose from long reach pole pruners, leaf blowers, long reach hedge trimmers, mini-cultivators and lawn edgers to name only the most popular multi-tool accessories. The power units are normally lightweight 25cc 2-stroke engines, designed to keep weight to a minimum but provide enough power to be sufficient for most practical garden tasks. From time to time you may find it necessary to remove animals from your garden, particularly if they are beginning to disrupt your normal day-to-day activities or start to munch their way through valuable garden crops or carefully planted flowerbeds and borders. If this is the case, The Big Cheese range of pest control and removal equipment will come to your aid in a variety of cages and deterrents that will safely remove animals from rats and rabbits to wasps and flies. It is possible to choose from household flytraps that can be used indoors or specifically designed insect traps intended for greenhouse use. Cages of differing sizes are available to contain small mammals and rodents to larger rabbit sized creatures. Humane designs are also manufactured to ensure that relocation of animals is achieved without harm.